100 Year Old Weblog: OLD CITY LANDMARK SOLD AND TO BE RAZED. ~ M'LEAN MANSION TO MAKE WAY FOR PARK. OLD CITY LANDMARK SOLD AND TO BE RAZED. ~ M'LEAN MANSION TO MAKE WAY FOR PARK. SOLD AND TO BE RAZED. M'LEAN MANSION ON "QUALITY HILL." Up on the highest point of "Quality Hill" being at the north end of the Kersey Coates drive, stands the McLean mansion, one of the oldest of the fine old homesteads of Kansas City. This house, three stories in height, constructed of brick and containing sixteen large rooms finished in walnut, was recently sold by the city for $55. Soon it is to be torn down and the space on which it stands, overlooking the Missouri river and Kansas City, Kas., is to be used by the city for park purposes. Built almost half a century ago, the old mansion ,the finest on "Quality Hill," stands today a landmark of the early aristocracy of Kansas City. That it is soon to be entirely demolished is a sore thought to many of the old-timers, and no few of them are making pilgrimages to the old home in which many of them have spent happy hours as guests of Mrs. Ella M. McLean. Back of the huge old house stood the brick barn, smaller and less magnificent by far. It has been sold for $45 and has already been razed. 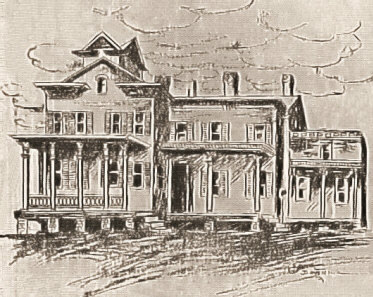 So high upon the bluff does the house stand that in the old days of Kansas City the lights from the windows at night used to serve as markers for the steamboats as they plied the muddy Missouri. It was the first evidence of Kansas City as the boats floated down stream, and the house was known among the river men as "McLean's Beacon." Few of the young generation know the old house. Few have ever seen it, since it stands so far out of the way of drives and ordinary walks. But it is a typical structure of the earlier days of Kansas City, full of corners and rooms ad hallways which must cause the pioneers of Kansas City many reminiscent thoughts.